54 takes place on a beautiful golf course just north of Boston during fall foliage at its peak creating a spectacular backdrop for this contemporary romantic golf adventure. The story spans ten years and culminates in this competitive golf tournament with Jim Peters challenging the demanding course alongside his best friend Max Johnson. This journey takes you through their golf adventures with the women in their lives and an exciting suspenseful twist all the while chasing golf’s ultimate goal. 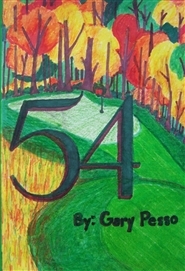 54 is a fictitious golf story and a love story both the golf enthusiast and the non-golfer will equally enjoy.